Over the summer i set myself a styled mini brief to try help myself improve my 3d modelling. I did this first by doing an rc car (see in my previous rc car process blog) but to step it up i wanted to model my own car. I own a 1996 classic mini equinox which is my pride and joy, what better to model that a car i can just go outside and see my mistakes in my 3d work. all my reference images are from my own car which i kept flicking to on facebook aswell. This is how i got on i wont go into too much detail as it was a fairly extensive process, but i have captioned the process images to give you an idea what is going on and how i possibly did it. So with putting all this together and finally tweaking everything to my liking, some pieces i added for personal preference. I was basically adding pieces to my car that i may do in the future. This could turn out beneficial when im unsure on buying something on my car i could model it add to it and see what it could look like. Anyways to the final piece i was very pleased with. 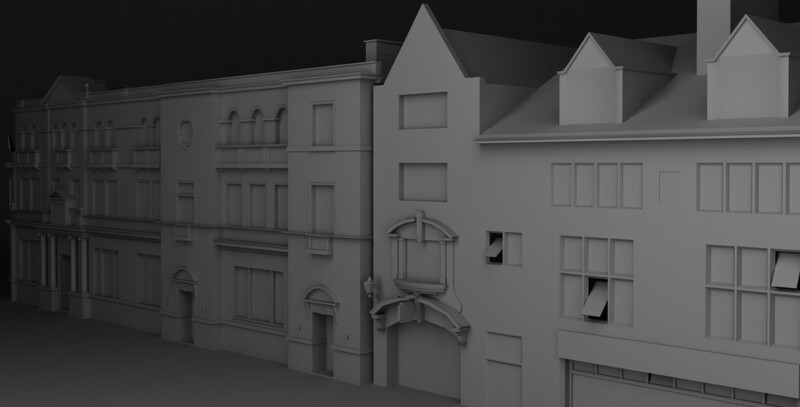 I came across lots of problems all of which i felt i tackled well, pinching, z fighting, smoothing issues, verts where they should be, overlapping, and getting the reference images in each viewport work when i change the view angle in my 3dsmax view. During this process i learnt massive amount about how i like to model and things i can use whilst modelling like new modifiers. One inparticular was FFD’s (Free form deformation) this allowed me to use control points to edit the shape of whatever i was shaping e.g. i did this for my bonnet to create a smooth curve on edges and surface. The modifier i used the most was definately Symmetry, this allows you to do half the work, all you do is model half apply symmetry modifier and make sure the mirror is central so that the vertexes in the middle can weld together or adjust the weld distance so it fits your reference viewports. Turbosmooth gave the model the high poly realistic aspect to the model, this varied in iterations dependent on what was nessacery e.g. the rims for the wheels needed 3 iterations due to the complex shapes of the spokes whereas the indicators only needed 1 iteration. Here it is untextured, im currently looking into Mental Ray texturing and rendering in 3ds max to give myself a realistic looking textured car model. So there it is..My high poly Classic Mini! The polycount came to 879,277, a massive 563,715 of that beging the wheels which is huge in proportion to the rest. This will need to be baked down if i was to use it in a game realisticly, which would be a normal map applied to a low poly version of my mini to give it the appearance of a high poly model. Started experimenting with 3ds Max in Mental Ray texturing using some preset and adjusting specular and gloss levels for certain things. Anything that looks white is Chrome in the actual render window but i need to set up lighting for this to show i will get to this. I rendered it at a couple of angles to see what it all looks like, this made me notice the glossiness and specular of the paint was far too high so it would need to be toned down. Also the glass effect i added to the lights didnt work as i needed to apply a interior texture for the lights it did work for the spotlights, and im yet to seperate the windows so they are just part of the car paint. All work in progress. All in all im very pleased with the outcome, the model looks just like a mini its all to scale. I must give myself plaudits for pulled this off for sheer grit and determination to improve as there was times it wasnt going right and i wanted to stop but fighting past that wall is the way to improve. This actually turned out extremely useful doing this car as our client brief is set in the 1960s so i can use my mini with some minor adjustements to match the 1960s or previous model of the classic mini to go into our project. Due to my car the group wants me to do vehicles for the level as its not the easiest of modelling tasks. Automotive modelling really appeals to me and id like to pursue it further and improve more. Any feedback on my mini would be hugely appreciated and beneficial to my progress. Thanks. Due to uploading for feedback and critique on polycount, i have been advised to show my wireframes in my showcase of my model. So here are some additional images with wireframes. Categories: General, Year 2 | Tags: 3D, 3D Model, Autodesk 3ds Max, Brief, Car, Classic, Design, Design Process, Mental Ray, Mini, Model, Models, Modifiers, PHASEgaming, Polycount, Reference, Self-Initiated, Technical skills, texture, Viewports | Permalink.